Deep in the Romanian forest, a team of scientists stumbles upon the ruins of a 13th-century abbey. On further inspection, they make a startling discovery - the abbey is built over the entrance to a giant underground cave system. Local biologists believe the cave could be home to an undiscovered ecosystem, so they hire a group of American cave explorers to help them investigate its depths. Jack (Cole Hauser) and his brother Tyler (Eddie Cibrian) are thrill-seeking professional cave explorers who run a team of the top divers in the world. The crack unit, which also includes Charlie (Piper Perabo) and Buchanan (Morris Chestnut), immediately begin their exploration. But what they find deep inside the caves is not just a new eco-system, but an entirely new species altogether. This is the first time I ever seen this movie. I picked it up when I found it cheap... and remembered that it was suggested by a friend. It is a decent enough movie... though I definitely have seen better... it is worth checking out. Naturally since the majority of this movie happens in caves the movie itself is rather dark... but not overly dark where you are questioning what is going on. It is one of those shows where you only get quick glimpses of the creatures here and there... though there is some decent views as well.One thing I didn't like is that there is no Theatrical Trailer on the disc. This was a "Blind Buy" for me... and I would have liked to check out the trailer before the movie... I always felt trailers not only give you a look at what the movie is about... but it also gets you in the mood for the movie. But as it seems to be common place anymore... the trailer was missing from this release. Well... hard to say... since I never seen that movie... but going by the overview it sounds like it. But hard to say which came first as they came out about the same time... both were apparently made in 2005 (only going by the profiles). I got this DVD a long time ago... it was shrink wrapped together with another movie (Expecting Mercy) and in the Walmart $5.00 Bargain Bin. So basically only paid $2.50 for this movie. Naturally I went into this movie with no expectations what so ever... as I never even heard of it before. I have to say... it wasn't a bad movie... wasn't great... but I did enjoy it. I do think it tried a little too hard to put twists into the movie... some worked.. others only confused things. The movie was made in 1988... and is Full Framed... so I imagine it was one of those direct to video releases. Even though I can't complain what with how little I paid... I was a little disappointed by the fact that there was no extras what so ever... not even a single trailer of any kind. When you pop in the disc you get a menu with 2 options on it... Play Movie and Scene Selection. Now I don't know that I would go as far as recommend buying this one... but if you can find it real cheap (like a deal I got)... it is worth it. If not I would recommend renting it first. A perfect romantic getaway turns into a hellish nightmare in this suspense-filled thriller! Architect Scott Campbell ('Ronald Foster') and his wife Nancy ('Merry Anders') join another couple, Joseph and Loy Schiller ('Richard Crane' and 'Erika Peters'), for what promises to be a pleasant stay at an empty castle set on a seculded California hillside. Soon, however, tension mounts as terrifying things begin happening: A group of ghoulish circus performers who once inhabited the castle become increasingly hostile towards their "guests," turning their mini-vacation into a life-and-death challenge of wits! I got this DVD this past October for $5 at Walmart during their Halloween sale. I got it based on a good friend's suggestion that knew I was wanting to check out more classic movies. I got to say... I really enjoyed this one... it is not something that is really scary... actually nothing more then slightly suspenseful. But enjoyable all the same. I am glad I decided to add it to my classics collection. Of course the movie is in Black & White... but the dvd has both widescreen and the Pan and Scam version... as well as a couple extras... the Theatrical Trailer (yay!) and a Photo Gallery of the Movie Posters. "A shocker reminiscent of Alfred Hitchcock's THE BIRDS" ('Variety'), this amphibious horror flick teeming with thousands of nasty-tempered creatures that are hopping mad -- and murderous. Jumping with action, suspense, revenge and Southern Gothic charm, FROGS' stars Ray Milland, Sam Elliott and Joan Van Ark are constantly a lily pad away from croaking! Jason Crockett (Milland) is an aging, physically disabled millionaire who invites his family to his island estate for his birthday party. The old man is more than crotchety...he's crazy! Hating nature, Crockett poisons anything that crawls on his property. But on the night of his shindig, it's nature's payback time, as thousands of frogs whip up every bug and slimy thing into a toxic frenzy until the entire environment goes environ-mental. I got this one out of the Walmart Bargain Bin several years ago... but could never get the courage up to watch it. Now that I have watched it... I really wish I didn't! This movie is so awful that it was almost painful to watch. I didn't think I would make it all the way through this one... and I kinda didn't... even though I played it all the way through... not long after it started I found myself at my desk on the net. When five teenagers unwittingly resurrect a demon, nobody is safe from the hideous creature's gruesome rampage. But this monster is different – inside it dwells the soul of a boy murdered years ago. Can the evil beast be destroyed... without killing the innocent boy trapped within? I went into this one thinking I never seen it before. But shortly into the movie I realized I did see this one many years ago. It is one that I did enjoy a lot... so glad I added it to my collection. Only problem is it is Full Screen... but I can't seem to find a widescreen version... is this movie direct to video and full screen is the OAR? LOL... no problem Jimmy... wouldn't recommend that one to my worst enemy! I highly recommend The Descent! It scared me quite a bit, something only a few films do these days. I believe it was actually released slightly after The Cave but most critics agree that the former is the better film. If you want to check it out, make sure you get the original director's cut, not the modified US version! Thanks Achim... I would love to check it out unfortunately I only have an R1 player... so if it is available here in the US I will get the director's cut. I remember someone posted a way to make a R1 be able to play other regions. I took a look through the forums and can't find it but I'm almost positive I saved that info on my laptop. I'll check on it when I get home tonight and, if it's there, I'll let you know. I read through it and it didn't sound too complicated but with all the computer experts here I'm sure someone can help you if needed. I remember someone posted a way to make a R1 be able to play other regions. I took a look through the forums and can't find it but I'm almost positive I saved that info on my laptop. The chance are good that your reader is already multizone and you just need the code to activate it, no need to buy a 300$ zonefree reader. With your dvd reader brand and his model you will find the information easilly. It seems there is the theatrical version on DVD (at DVD Empire only in Full Screen ) and an unrated version, which says "Original Unrated Cut" on the cover. I suppose that's the one you might want to get. (I have the R2 version muyself, so I cannot confirm about the R1 disc myself). In 'Red Dragon' we learned who he was. In 'The Silence of the Lambs', we learned how he did it. Now comes the most chilling chapter in the saga of Hannibal Lecter - the one that answers the most elusive question of all - why? Written by Thomas Harris, the best-selling author of the Hannibal book series, this "fascinating and terrifying journey into the making of a monster" (Pete Hammond, 'Maxim') reveals for the first time the metamorphosis of a brilliant medical student into "Hannibal the Cannibal." Good Morning America's Joel Siegel says, "if you can keep your eyes open, you're going to get scared." 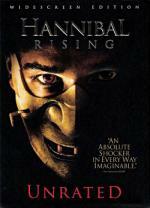 I admit that I went into this one with fairly high expectations... as I really loved all the other Hannibal movies. But I did have concerns about this one... it is a fairly long movie at 2 hours... and I never heard of this Gaspard Ulliel that plays Hannibal. And lets face it... he had some pretty big shoes to fill. I did find it to move a little on the slow side... which I normally do not like as I can easily dose off on a movie in such cases. But in this case I believe the slow pace works for the movie. As for Gaspard Ulliel... I thought he did a pretty good job at showing us a young Hannibal Lecter. So over all... I really enjoyed this... despite my concerns.